We have an outlook here at DSC that takes the default view of positivity about our racing, and of the decisions made by those who hold responsibility for running it and promoting it. 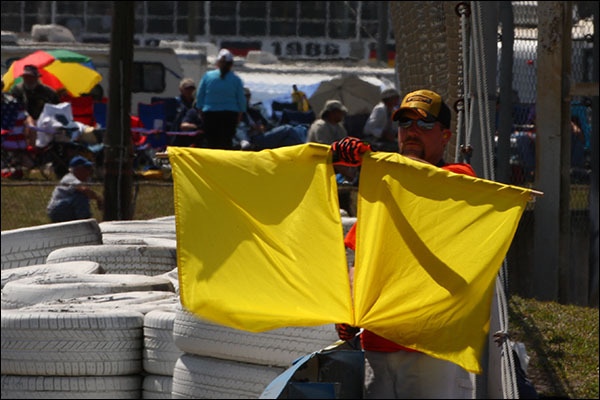 It is fair to say though that various happenings at Sebring last week made that approach very difficult to maintain. It led too to a conclusion of something that DSC has never called for before – and not in a good way! First the upside – The 2014 12 Hours of Sebring had a very large and varied grid with much more than a smattering of top talent, the crowd was large, lots of publicity was around about record ticket sales, though certainly we believe we have seen much larger in the past decade and a half, with parts of the grounds seeming much, much quieter by comparison with some Sebring weeks in recent years. The performance balancing was pretty good on the whole, though there were still issues being discussed in three of the classes, something that officials, media and fans are going to have to get used to if DSC’s now extensive experience of the BoP process elsewhere is anything to go by! Several experienced P2 hands complained heavily that the power advantage of the DPs, and in particular the Ford engined cars, made it impossible to battle head to head and almost entirely impossible when the DP was ahead, the only area where superiority could be made to pay off being under braking and P2 cars are the more susceptible to damage from contact in those situations. Overall lap times though were far closer across the board. 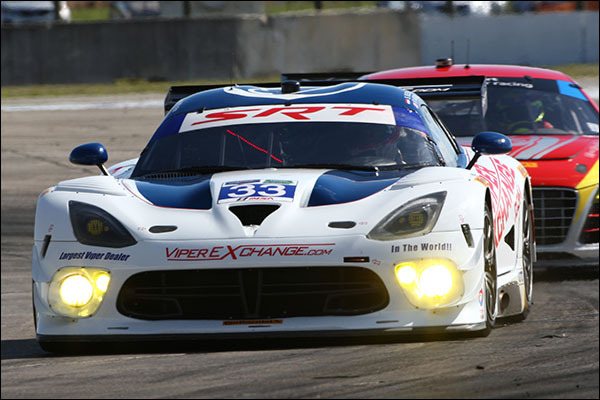 In GTLM the Viper boys were very unhappy with the effect of the most recent Balance of Performance and remained so throughout the race too, despite the fact that they managed to finish well up the order, though not on performance, at all, they maintain. 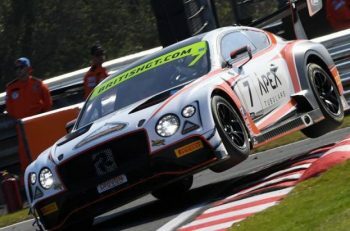 In GTD the Audi runners were even less happy, “Not even close” was the answer to a polite question post qualifying of one major runner, the R8s languishing well down the order – They too had a better time in the race, at least with a couple of the cars, the R8s better in traffic than on their own. Of more serious import for the teams concerned were the various changes made to driver rankings, and more serious still the length of time taken for questions, queries and appeals to be processed and responded to. It’s the latter issue that goes to the heart of wider issues for TUSCC – because the blunt fact appears to be that the level of customer support (in this instance the ‘customer’ being the teams) , and more seriously customer respect appears to be at an entirely unsatisfactory level. Will the potential for reclassification continue? How many full season teams can, or will be prepared to re-organise to accommodate the changes? – Certainly one team we spoke to at length may well not be back. Then there’s the question of the driving standards of those that were in the race. Let’s be blunt here. It has been a long, long time since this writer saw such repeated poor driving at this level of the sport. At this point Matteo Malucelli should be mentioned – We’re not aware of any mechanical issue that might have been behind either his initial off, or the very odd move he made when rejoining. 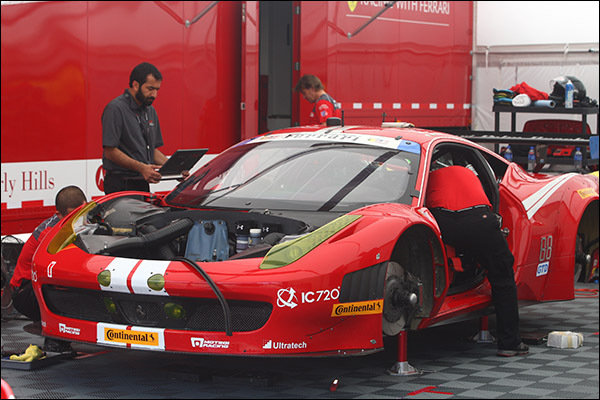 Either way it led to the retirement of the Risi car again, and led to heavy damage to a further pair of cars too – It could have been even worse. Guiseppe Risi’s already pretty stretched humour levels will no doubt have made the post incident debrief a distinctly difficult one for his driver. PC in particular had its problems with almost the entire field featuring in off course incidents and/ or worse. “It’s interesting isn’t it over how many of the PC cars go off backwards?” said one driver. The further observation has been made that the cars are difficult to set up for stable braking, and that whilst the Pro drivers can drive round this some of the Gentlemen have really struggled. There were at least three incidents involving PC cars in multiple that gave cause for concern, and of the 10 cars that started the race we only know of two that weren’t involved in major contact and/ or off track incidents. The lead battle between the Core and #09 RSR cars was proof positive that these cars can be driven well and safely and can be raced in close proximity too – Hats off to Messrs Heinemeier Hansson, Gue, Braun and Junqueira in particular for a long, clean and at times thrilling duel. David Ostella had a moment to forget in the #38 Performance Tech car, driving straight off the road and destroying his own car before being lucky to walk away after being t-boned by the luckless Frankie Montecalvo in the PR1/Mathiasen Motorsports version, both cars comprehensively out on the spot. Montecalvo, it should be said, did a fantastic job of getting on the brakes as hard as he did as the chaos ahead of him unfolded – If this incident proved one thing it shows there’s nothing wrong with the FLM09 in driver safety terms. That was underlined again with the next, and by far the potentially most serious, incident with historic racer Gaston Kearby having spun out on the exit of T16 (another car to go off backwards). His timing to attempt to retake the track was awful, the driver having not apparently checked with marshals over a point where there would be a gap in traffic (at a fast blind turn) and not taking the time for the car to be recovered to allow a more orderly return to the fray. His attempted spin turn began as a gaggle of prototypes appeared at high speed through T16, certainly the leading car of the group was visible before the Kearby BAR1 car speared across its bows and sat broadside across the outside of the track, poor Alex Tagliani had absolutely nowhere to go and it was only the rapid reactions of Jordan Taylor behind that allowed him to avoid ploughing into the resultant wreck, the #10 car taking to the grass in avoidance with the #2 HPD also barely missing the debris field. The net effect of Kearby’s error was terrifying and potentially catastrophic, Tagliani fortunate to escape with a badly sprained wrist, both cars heavily damaged. If ever there was an incident that deserved some sort of sanction against a driver then this was it. It was a multi-layered (and no doubt adrenaline fuelled) error but whether you choose to punish the action or the consequence both were at fault here. 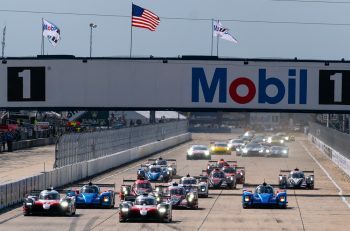 The high profile disbanding of the ALMS IMSA Safety Team after the end of the 2013 season raised plenty of eyebrows, safety should always be at the core of the way a race meeting is organised and conducted and this seemed a decision that was doomed to be re-assessed in the wake of any serious incident. 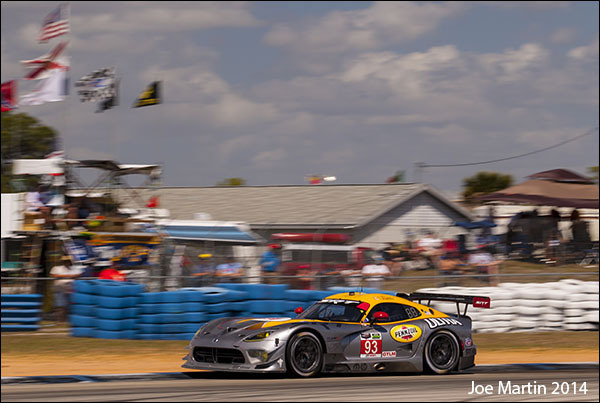 The incident that raised most comment in this arena at Sebring was the fire that befell the #33 GTD Viper of Ben Keating. A mechanical failure stopped the car on track and, apparently, punctured the fuel cell too with a fire developing seconds after the car had come to a stop on track, and quickly developed into a car destroying conflagration. What is apparent though is that it took 64 seconds for the first fire tender to arrive, and that it then pulled up in harms way, causing a further 20 second delay before the tender could be placed in a position from which the fire could begin to be fought. Much has been said about how long the fire took to be finally extinguished too but it’s the response time that concerns this writer the most. That needs to be looked at very carefully – and fast! There’s good news and bad news over the MRN radio coverage – The good news is that Greg Creamer, added post Daytona, was right on his game, added enormously to the quality of the broadcast and gave the listeners at least some semblance of a knowledgable anchor. It was good to hear Ryan Eversley too, his insight was always valid, always interesting though there were times when an otherwise struggling team around him tried too often to lean on their ‘colour‘ man for support. Beyond that though there was precious little to admire. Honestly if one of your lead commentators can’t even be bothered to pronounce Sebring properly then there has to be a question or several asked as to what genuine right he has to be doing the job in the first place. I’m happy enough to have a chuckle about the odd mangled name or several (dozen) but there is little or no sign of this team having done their homework, no sign of them coming to say hello and do some fact gathering in the press room, and not a lot of sign of the same happening in the paddock either. There will be those who will say – “you would say that wouldn’t you” – Those that know me well would know that if this offering was half as good as it needed to be then I wouldn’t. 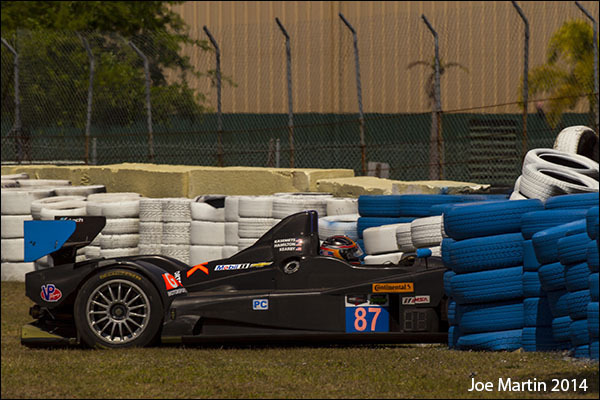 Commentary is a tough job, and sportscar racing with it’s multi-class complications is more tricky than most. It is though a job that needs to be treated with respect by the post holders and to them I’d say this – If you don’t like being criticised then do some homework, there are few (if any) that wouldn’t be prepared to share their knowledge with you. For now though I’d be prepared to wager a solid bet that the listening audience is dwindling, certainly for the second race in succession the overall effect was like being punched repeatedly in the face – it was nice when it stopped! TUSCC’s corporate ownership attracted a lot of pre-season commentary about the potential for ‘NASCARisation’ and, sadly, the record thus far of the series in terms of the willingness to throw a yellow, and then to have that caution period extend for a substantial length of time has poured a lot of VP Racing Fuel – Official fuel supplier of IMSA – onto the fire. Yes there were a lot of incidents at Sebring, some of them quite serious, but the reality is that not all of them were, but even in those we followed the full, and progressively more tedious and disruptive chain of pits closed, pits open for the P cars, pits open for the GT cars, wave by, etc etc. Frankly from this observers point of view the lengthy and repeated incidence of full course yellows ruined a second consecutive blue riband event. To be racing for under 7 hours of the 12 surely deserves a proper examination of how this event was conducted – and changes HAVE to be made. All told we had 11 full course yellows, and two at east were extended due to a second incident under caution – If this is being done in any way shape form, or extent to do with entertainment then here’s a wake up call, NO entertainment was supplied for over 5 hours! As an example, much has been said about the final yellow flag period, called for the recovery of the Marsh Bros. Vette DP out of harms way after the #31 had ground to a halt on an escape road at the start of the final hour. The car was towed to safety in a matter of just a very few minutes but the field stayed under caution for 33 minutes and, ironically, bunching up the field ruined several battles that might well have gone to the flag. Post race reassurance that “this will be looked at” frankly betrays a point that either IMSA sleepwalked into this issue, or that the cynics are (sometimes) correct. The powers that be should be very concerned indeed as to how on earth will this policy play out at the more prevalent shorter race distances. 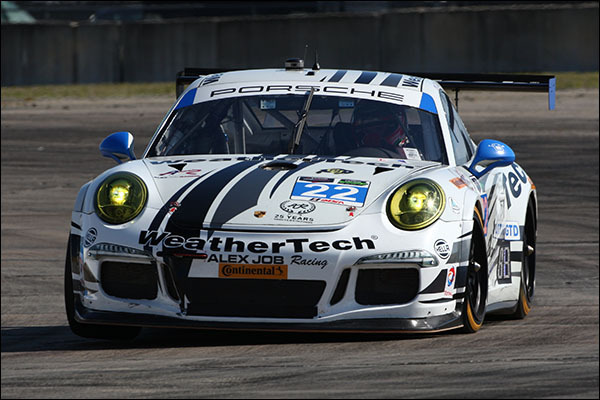 After the self inflicted gunshot wound to the foot that was the GTD result at Daytona the last thing that was needed was a repeat at Sebring. The good news was that the same error wasn’t repeated, the bad news is that what actually happened was far, far worse. Alex Job is one of the class acts of the paddock, decades of experience, and in his 25th year at Sebring, his team had the opportunity to bring home an astonishing tenth win. To lose out on that because of poor officiating is a massive blow to his team’s season, and to the credibility of the new Series, not just in the eyes of the team involved but to everyone in the paddock, the press room and in the stands. 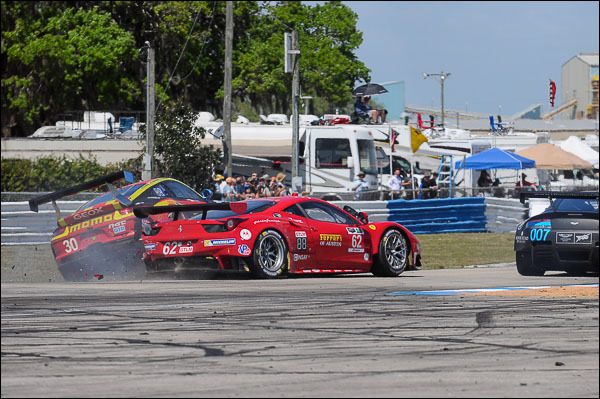 The tale surrounds two (of three -the #49 was also hit early in the race by a PC car) contact incidents involving the #49 Spirit of Race Ferrari,both of which were attributed by the race stewards to the #22 Weathertech/ AJR GTD class Porsche. The final blow was dealt by roof camera footage of the second incident and it was this that secured the penalty call (stop and 80 second hold) that took the #22 car out of second place in the GTD class and off the lead lap. Now here’s where it gets beyond a level that should be professionally acceptable. Having been punished for two separate ‘avoidable contact’ incidents it quickly became apparent that the #22 car was not responsible for either. The first involved the #911 GTLM car and the second its sister #912 car, and it was this incident that was captured on video, with the GTLM cars Michelin branding in clear view on the roof of the car (The GTD cars run on spec Continental tyres). No appeal was permitted and the team were told that the car would be excluded if the penalty was not served immediately. It’s worth reflecting too that the car that perhaps should have been penalised went on to win the highly prized GTLM class, their closest competitors will be feeling rightly aggrieved too. It’s difficult enough to understand how on earth this could happen, but it’s beyond even that level of incredulity that applies when hearing that no appeal was allowed, and that no retrospective adjustment could be made. Remember the race had hours still to run, and the AJR team apparently had footage that proved their point. Whilst on one hand it was correct for Scot Elkins to come to the press room, explain the errors by Race Control and make an apology, the reality is that in the real world of racing at this level post race apologies frankly mean nothing, the points aren’t on the board and the trophy lies elsewhere. We have never, ever gone this far before on DSC but after a decision that robbed the winning team of a podium celebration at Daytona and now another at Sebring that cost one potential winner their chance in one class and failed to punish another that went on to win theirs the question has to be asked – Just how bad does it have to get before somebody loses their right to make these decisions again?